It’d been a while since we dared to enter the Carmel Market on a late Friday afternoon. At that hour the shook is packed, so crowded you can barely move. The first sign it was late in the day (as if we needed one) was when I went to my greens guy and asked for a head of lettuce. He gave me four. Four heads of fluffy, curly lettuce. They filled an entire grocery bag. I guess he likes me as much as I like him. As Eitan wilted in the heat, we cut a quick retreat down a side alley, coincidentally (or not) passing one of the far-east specialty stands. 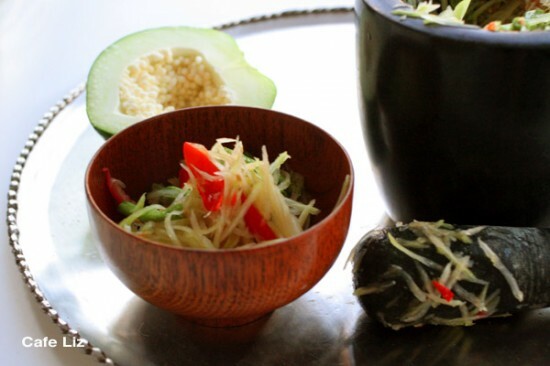 Among the many things that require cooking and the sundry strange gourds was a pile of green papayas — green, crunchy, watery papayas, which get chilled and grated into refreshing, Thai salads. I snatched one. After all, a papaya salad is a great way to cool off in the summer. It’s light food, with a bit of heat — from hot peppers, of course; the salad itself is cold. The recipe is more or less one I learned at a cooking course in Thailand, where you can find these salads whipped up by street vendors. There, the ingredients are pounded together with a wooden mortar and pestle, which bruises the ingredients to combine the flavors; it doesn’t smash them entirely. I made this in my stone mortar and pestle, because that’s what I have; if you don’t have a mortar and pestle, you could bruise the ingredients by mashing them with another hard object (say, a coffee cup); just don’t break your bowl. Also: Here’s my map of Thai foods at the Carmel Market as well as my description of the shops. Lightly chop and then crush the garlic clove and hot pepper in the mortar and pestle. Chop the green beans into 1-inch (2-3 centimeter) strips, add to the mortar and pestle, and pound until broken. Slice the tomato into thin wedges. Add to the mortar and pestle along with the sugar, lemon juice and optional salt/fish sauce. Pound to combine. 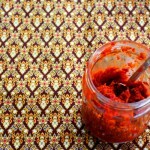 Julienne the papaya with a julienne peeler, food processor or knife. Add to the mortar and pestle and pound to mix. 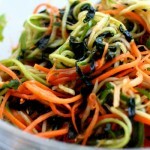 6 Responses to "Thai papaya salad"
I know that stand on shuk HaCarmel, and I have also bought green papaya there,yummy! I love that salad! It’s great, no? Welcome back to Israel! 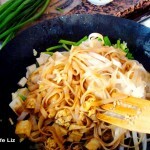 Liz – this was one of my most favorite things to eat in Thailand! I’m so thrilled you made this here. Another favorite was a similar cold salad, this, minus the papaya, but with more tomato, also very spicy, and with a poached (or runny-ish) egg on top. Wow, I’ve never seen/heard of that salad with egg — sounds intriguing!